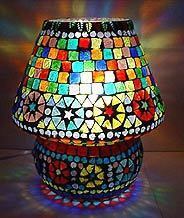 Fine Decorative Glass Beads Lamp Available In Different Designs & sizes. With the assistance of our dedicated team of professionals, we are providing a premium quality range of Lamp. Hand made lamp shade from Indonesia using coconut leaf painted strips . 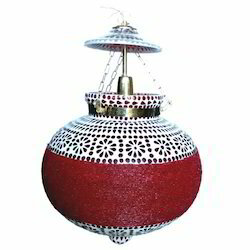 We are offering to our clients, Beaded Hanging Lamps, which are intricately designed as per the latest market trends. These lamps are perfect to illuminate a dinner party or a solitary midnight snack. We can customize these on various parameters like sizes, colors, and shapes as per the requirements of our clients. We offer beautifully shaped clear glass lamp in variety of sizes, designs and shapes that enhance the decor of room. It is very delicately fabricated using superior quality glass and gives a shining finish. We also provide customization as per the varied requirements of client. The designer Beaded Lamps show the creativity of our craftsmen and artisans. These are available in a wide range of colours with elegant designs and patterns. Crafted using premium quality raw material the lamps comply with the international quality standard. These lamps are attractive in design and have high durability. Our clients can avail these from us at market leading prices. We offer quality bead hanging lamp that can be availed from us in varied designs and finish options to choose from. Our skilled workforce & craftsmen also have with them expertise in designing these designer bead hanging lamps with fine artistry so as to meet the aesthetic needs of our clients. Beaded lamps made of wood and resin, illuminate your homes with elegance and grace.